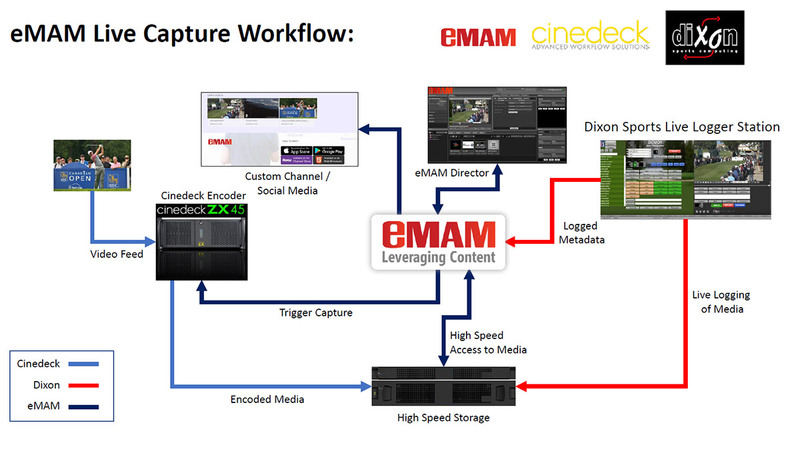 eMAM Live supports live capture, logging, edit and delivery of media for corporate and sporting events. eMAM users can send some or all of their media to AI systems to for indexing to show results in eMAM and to power search. Managing the flood of content in the digital age has become a major challenge for organizations everywhere. Companies have had to adapt ways to organize and share information and simultaneously transition from tape-based workflows to digital file-based environments. To manage these rapidly changing dynamics, Empress Media Asset Management, LLC developed eMAMTM, a powerful and flexible web-accessible media asset management system for users to easily manage all their digital assets throughout their workflow from any global location. eMAM has two types of buttons to streamline and automate your workflows. With the eMAM server-side button, you can set up a metadata button to trigger any type of workflow on the eMAM server from a single click. Using the workflow configuration settings, and a little programming, you set any workflow including delivery, publishing, and archive to any of the numerous API interconnected systems. Send metadata, JSON, XML, and so forth as HTTP POST. If needed, our technical team or our system integrators can walk you through the process. Through a direct integration with MEWS and Vantage, eMAM users can transfer media from the eMAM platform to a standalone Media Composer, In a Share storage environment and in an Interplay configuration. Within DAM/MAM environments, using unstructured data when tagging assets, has always made it challenging to search and find relevant content. The increase in supply and demand for video has made it even more challenging to provide vital and searchable metadata to allow individuals to find valued videos as well as meaningful information about what is found on individual frames. The labor-intensive nature of tagging media has strained operational budgets, and far too often, has left media poorly tagged. In today’s organizations where video is mission critical, poor tagging limits the usefulness of content.